De novo genome assembly can be challenging due to inherent properties of the reads, even when using current state-of-the-art assembly tools based on de Bruijn graphs. Often users are not bio-informaticians and, in a black box approach, utilise assembly parameters such as contig length and N50 to generate whole genome sequences, potentially resulting in mis-assemblies. Utilising several assembly tools based on de Bruijn graphs like Velvet, SPAdes and IDBA, we demonstrate that at the optimal N50, mis-assemblies do occur, even when using the multi-k-mer approaches of SPAdes and IDBA. We demonstrate that whole genome mapping can be used to identify these mis-assemblies and can guide the selection of the best k-mer size which yields the highest N50 without mis-assemblies. We demonstrate the utility of whole genome mapping (WGM) as a tool to identify mis-assemblies and to guide k-mer selection and higher quality de novo genome assembly of bacterial genomes. Genome assembly is often a primary step in the process of yielding results that lead to interpretation of biological data and hence sub-optimally assembled genomes might lead to faulty conclusions . Factors causing such low quality genome assembly include sequence quality, presence of repetitive sequences, base composition, size and low genome coverage [2, 3], all of which complicate downstream data analysis using the available tools . Currently, de novo assemblers based on de Bruijn graph are considered to yield the best results provided sufficient sequence quality and coverage are achieved. Such assembly tools based on de Bruijn graph algorithms, like Velvet  and SPAdes  use k-mers as building blocks, but as most users are not bio-informaticians, these tools are often considered as an encrypted black box with the quality of the assembly usually determined by statistics parameters such as the N50 and the size and number of contigs or scaffolds produced by the assemblers . However, the choice of the k-mer size is crucial as too low or too high k-mer sizes lead to sub-optimal assemblies. Indeed, low quality reads might produce false positive vertices, repeats lead to branching, while an uneven distribution of the reads results in gaps. The use of smaller k-mers reduces the problem associated with low quality reads and their uneven distribution, while larger k-mer sizes help to bridge repeat regions decreasing the branching problem . In a balancing exercise, various k-mer sizes are usually selected, evaluating optimization by aiming for high N50 values and long, but fewer contigs. Whole Genome Mapping (WGM; Opgen Inc, Gaithersburg, MD, USA) is a relatively novel technique that generates high-resolution restriction maps of a genome based on the alignment of single DNA molecules cut with restriction enzymes and ordered with high resolution and accuracy . WGM was proven helpful in mapping de novo assembled contigs against previously sequenced related genomes . In this paper, we evaluated the utility of WGM for proper k-mer size selection and for optimization of parameters for de novo genome assembly. The whole genome sequence of a methicillin-resistant Staphylococcus aureus (MRSA) strain (E-MRSA15-CC22-SCCmec IV) was generated on an Illumina HiSeq-2000 via 2X150b paired end sequencing . Reads were de novo assembled using Velvet, SPAdes and IDBA-UD employing a range of k-mers. Velvet, using a single k-mer approach ranging from k-mer size 81 to 123 showed an initial increase in N50 (until k-mer size 115) and longest contig size and a concomitant decrease in the total number of contigs with increasing k-mer size with both these parameters positively influencing the assembly outcome (Table 1). Ensuing, using WGM, a whole genome map of S. aureus EMRSA-15 was generated which, using MapSolver, was aligned with the assembly files corresponding to different k-mer sizes. Although the percentage of the genome covered by contigs increased with increasing k-mer size, a mis-assembly (spanning 119 kb) was identified for the mapped contigs (>40 kb) for higher k-mer sizes (Table 1), revealing the best (without mis-assemblies) assembly was actually obtained using a k-mer size of 93 despite a higher N50 and fewer contigs as when for example utilizing a k-mer size of 115 (Table 1, Figure 1A, B). In contrast, SPAdes, which allows to combine a range of k-mer sizes in a multi-k-mer approach did not yield any mis-assemblies on this sequence for the N50 based best assemblies (Figure 1C). The same was true for IDBA, which similarly utilizes an iterative process including multiple k-mer sizes, while removing assembled sequences in subsequent rounds of analysis. *Number of mapped contigs indicated between brackets. 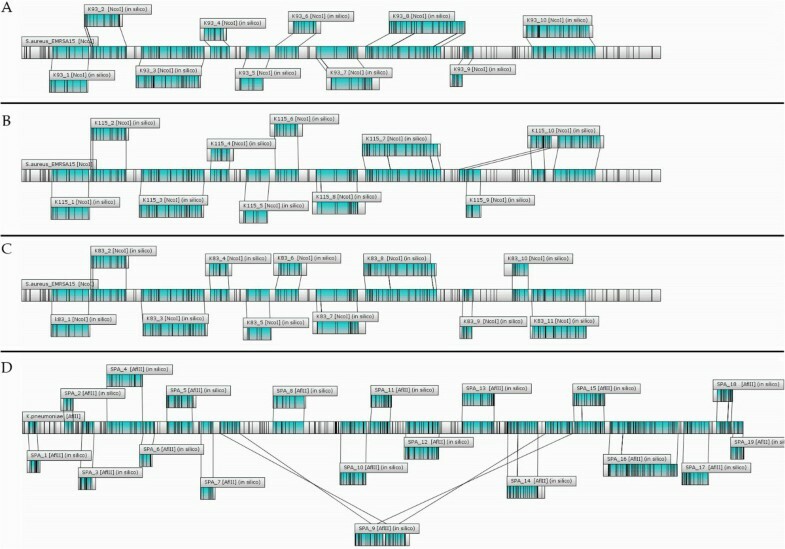 Alignment of contigs to the corresponding whole genome map: A) Velvet derived assembly using k-mer size 93, revealing no mis-assemblies; B) Velvet derived assembly using k-mer size 115, corresponding to the highest N50, but revealing mis-assemblies; C: SPAdes derived assembly using a multi- k-mer approach up to k-mer size 83, yielding the optimal N50 for this sequence and showing no mis-assemblies; D: SPAdes derived assembly using a multi- k-mer approach up to k-mer size 77, yielding the optimal N50 for this sequence, but showing mis-assemblies. The general applicability of these results was investigated using two additional, similarly obtained, S. aureus sequences [UA-S391(accession # CP007690) and Mu50-CC5-SCCmec II (ATCC700699; previously sequenced and available under accession # NC_002758], again revealing mis-assemblies for Velvet at the highest N50 values, while error free assemblies could be obtained for lower k-mer sizes (data not shown). In addition, the sequence of Klebsiella pneumoniae ST258 was similarly generated using Illumina HiSeq-2000 via 2X150b paired end sequencing and was assembled using all three assembly tools. In this case, apart from mis-assemblies seen for Velvet, also SPAdes and IDBA were shown to produce mis-assemblies for certain k-mer sizes (Figure 1D), further demonstrating the potential of WGM to identify mis-assemblies, even for assemblers utilizing multi-k-mer approaches (Additional file 1: Table S2). Genome assembly based on de Bruijn graphs potentially yields mis-assemblies when only considering standard parameters such as total number and length of the contigs and N50. However, Whole Genome Mapping provides a powerful tool to identify such mis-assemblies and to select the optimal k-mer sizes to produce optimally assembled genomes. Despite of its additional cost, the biological need for error-free and complete genomes makes WGM an indispensable technique during the process of genome assembly and its validation. Strains utilized in this study were obtained from the EU-FP6-MOSAR collection (MOZAR7-CC8-SCCmec III; http://www.mosar-sic.org), the European Staphylococcal Typing Network, HARMONY (E-MRSA15-CC22-SCCmec IV) and from the Network on Antimicrobial Resistance in Staphylococcus aureus Program, NARSA (Mu50-CC5-SCCmec II). This work is supported by funding from Research Foundation Flanders (FWO-F, Research project no. G.0983.10N), and the European Community (PREPARE network contract FP7-HEALTH F3 2013- no. 602525). B.B.X. is supported by University of Antwerp Research funds (BOF-DOCPRO 2012–27450). BBX participated in the design of the study and performed the data analysis; JS participated in the design of the study and was involved in whole genome mapping; PM participated in conceiving and drafting the manuscript and performed the image processing; JPH and HdG provided the strains and were involved in sequencing for this study; HG and SMK participated in conceiving the study and revised the manuscript. All authors read and approved the final manuscript.